The dog days of summer are upon us, but winter is just a few months away and Jeffersonville Mayor Mike Moore is already planning for the holidays. Moore has an extensive holiday card mailing list and for the first time ever he’s asking Jeffersonville students to help make the cards that will be sent to hundreds of fellow Hoosiers. 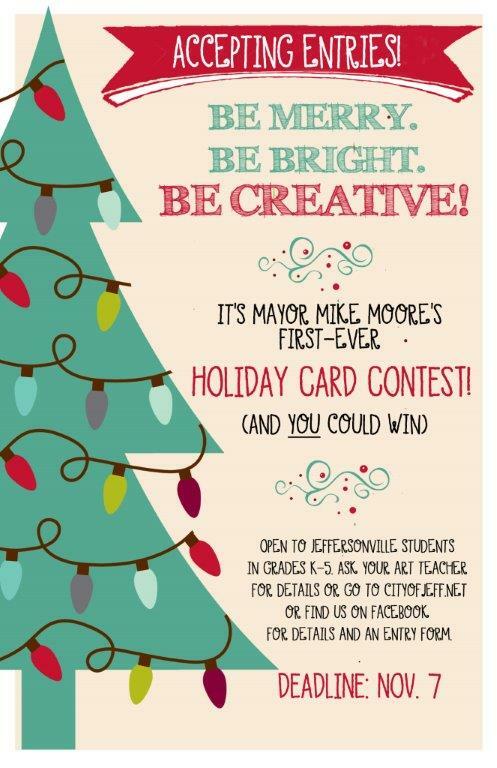 Through cooperation with Greater Clark County Schools and its art teachers, Jeffersonville students in grades K-5 are being asked to create a piece of art that can be reproduced as the official City of Jeffersonville holiday card. Artwork must be received in the mayor’s office no later than the end of business on Monday, November 7, 2016 for consideration in the contest. Entrants should include a completed entry form with their artwork. Entry forms are available from your student’s art teacher, at the mayor’s office in city hall or by downloading the Holiday Card Entry Form here. The winning artist will be named December 1, 2016. Only one grand prize winner will be selected, but other top entries will be displayed in City Hall during the holiday season. The grand prize winner will receive a prize package, including a pizza party for his/her entire classroom. The Jeffersonville Parks Department has a great lineup of programs and activities for all ages! Copyright © City Of Jeffersonville 2019. All rights reserved.